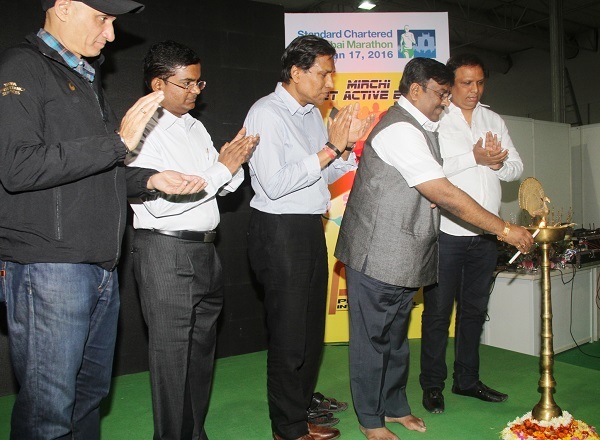 With just one week to go for the Standard Chartered Mumbai Marathon 2016 (SCMM), the Mirchi Get Active Expo was inaugurated by Sudhir Mungantiwar, Minister of Finance-Planning & Forest Departments, Government of Maharashtra and Ashish Shelar, MLA, President BJP Mumbai & Vice President of Mumbai Cricket Association. The three day expo was held from Jan 8 to 10, 2016 at the Plot No. 18, Bandra Kurla Complex, Mumbai. Besides being a one-stop destination for participants to familiarise themselves with the race day instructions including security arrangements, traffic restrictions, road closures, and other provisions, the expo also served as the venue for collecting their running numbers. 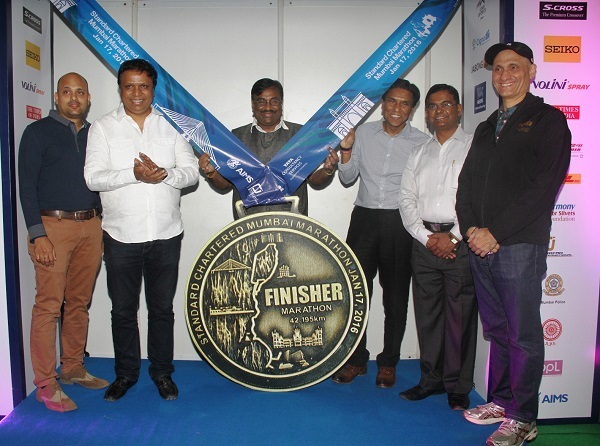 The excitement for the 13th edition of the Mumbai Marathon was built up over the weekend with the presence of various stalls put up by the event’s sponsors and partners. Sanjeeb Chaudhuri - Group Head, Brand & Chief, Marketing Office, Standard Chartered; Vikas Kharge - IAS, Secretary, Revenue and Forests Dept., Maharashtra State; Mahesh Shetty, COO, Radio Mirchi; and Vivek Singh - Jt. MD, Procam International, the promoters of SCMM were also present at the expo on Friday. The minister later took a stroll at the outlets set up by the brands associated with SCMM. Representing the official partners of the event - Standard Chartered and MCA - Ashish Shelar and Sanjeeb Chaudhuri also spent some time at the other partner’s stalls, taking stock of the arrangements at the expo. A few celebrities also visited the expo to participate in various brand promotions. Pro Kabbadi League team U Mumba’s Anup Kumar and Shabeer Bapu unveiled S-Cross at the Expo. 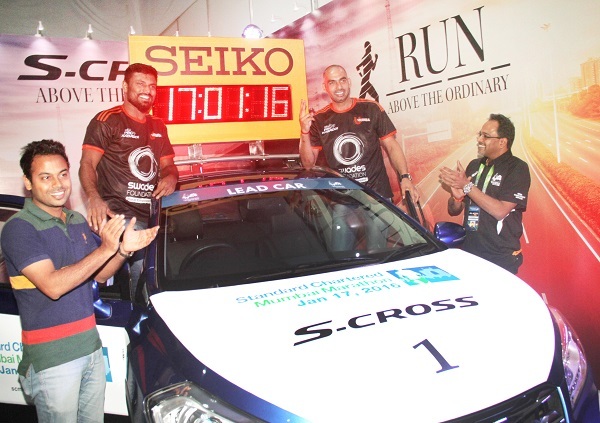 S-Cross - The Premium Crossover is the official Lead vehicle for SCMM. The players were also supporting the Swades Foundation. Mithun Gupta – Assistant Manager, Advertising & Marketing, Maruti Suzuki India and Dilip Jayaram - CEO, Procam International were also present on the occasion. 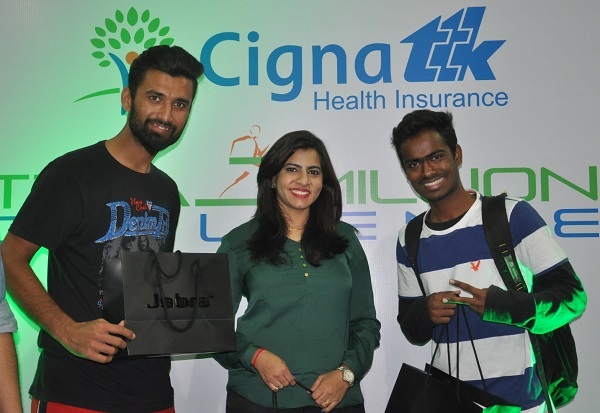 Cigna TTK Treadmillion Challenge, SCMM’s biggest activation, also concluded at the Mirchi Get Active Expo in Mumbai. 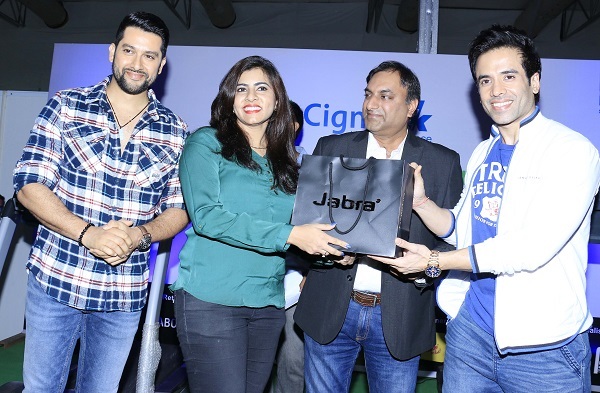 The top three winners were felicitated by Bollywood celebrities Aftab Shivdasani and Tusshar Kapoor. Parikshit Vaidya - Zonal Head, Cigna TTK also joined them in presenting gifts and vouchers from Goqii, SCS, and Dr. Kool to the winners - Aamir Siddiqui, Pintu Mandal, and Dolly Kotak. They were selected from over 2000 participants across 18 touch points over a period of one month. A total of 22 finalists were chosen to compete in the challenge’s finale. The winners were decided on the basis of their speed and distance covered in a minute. Mumbai is all set to host the 13th edition of Standard Chartered Mumbai Marathon on Jan 17, 2016. With over 40,000 runners this year, the marathon has never before seen such an overwhelming response from participants.Over the years, the most respected brands have partnered Mumbai Marathon for the transformational role it plays in bringing individuals, organizations and institutions together.This year, the event has three new sponsors on-board: S-CROSS, Nestlé, and Air India. The expo held at BKC from Jan 8 to 10 was a one-stop destination for runners to study the race day instructions in detail and collect their running numbers for the main event to be held on Jan 17.